As automotive luminaries go, they do not shine much brighter than Carroll Shelby! So, when the erstwhile racer turned his attention to the Ford Mustang - in 1965 - the sports car community sat up. The Mustang had been released the previous year - to great public acclaim! It had impressed in every area ... except one. In performance terms, the car was underwhelming. Enter Carroll Shelby! Styling-wise, the Mustang was fine. So, Shelby left that alone ... apart from side exhausts and stripes. Instead, he headed straight for the engine - a Cobra 4.7-litre V8. He already knew plenty about it - Shelby, it was, who had been the catalyst for the AC Cobra. When Shelby picked up his spanners, the V8 was producing 271bhp. Ford had already up-rated the original spec. Shelby, though, was sure there was more. He was right! By the time he put down his spanners, the figure had risen to 306bhp! Mainly, that was by modifying the manifolds. Though, a Holley carburettor certainly helped. Top speed had risen to 149mph ... with a 0-60 stat of 6.5s. Shelby, and his team - in their LA workshops - had made a 'meek and mild' Mustang into a 'muscle car'! But, it would not have been a 'Shelby' without racing attached! To wit, the 'SCCA B-Production' road-race series. The 'GT350R' duly hit the grid. It took the '65, '66 and '67 titles! Race series rules required that the car be a two-seater. The GT350R racer dished out 360bhp. And, while the roadster was not in that league, it was no slouch! Suspension and chassis were suitably solid - Koni shocks taking the strain. Front discs, and rear drums gave safe and sound braking. Transmission was 4-speed. Carroll Shelby had done it again! 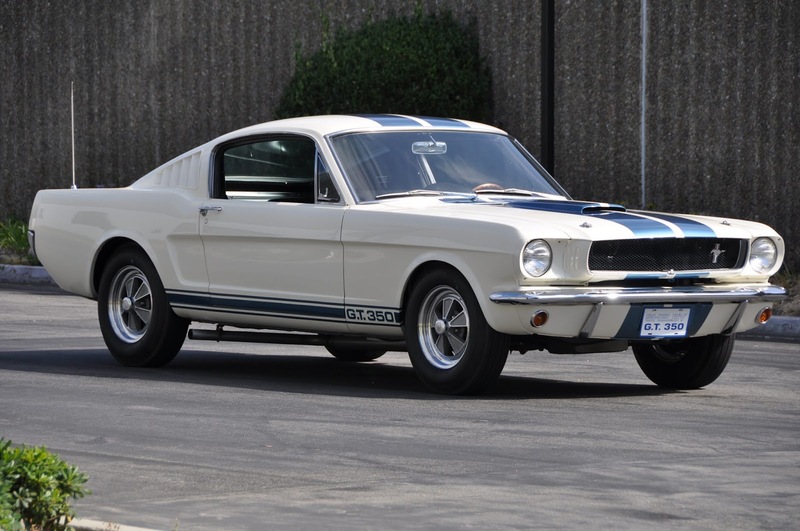 Cut from the same cloth as the AC Cobra, the GT350 was a thoroughbred sports car. But then, when a class act like Shelby got a hold of the Mustang, sparks were always going to fly. In a perfect trajectory, of course!